The Fool (R) says your wonderful qualities have become blocked, distorted and channelled in the wrong direction. Is your disappointment based on your emotional attachment to your expectations, hopes or dreams? Have you failed to follow your own instincts, refusing to take a “chance” at a crucial moment – choosing to listen to the practical advise of others? Explore all the aspects of life – use the energetic essence of who you are – be curious, ask questions and seek the answers within, then listen to your “inner” instruction and know without fear. Recognize that no action or attitude is right or wrong, except in its proper context. Always maintain your expectation of a result that would normally be impossible – even when everything “seems” negative – always expect the impossible! Seek and find within yourself the desire that most represents yourself and cultivate it at the expense of everything else. You have but one unique path which is yours and yours alone to follow. When you feel good about something – when everything seems to work better – you KNOW you are doing what is right. Trust and release your fears now. Always ask yourself if you have made the right choice and accept that even you can be wrong. When you are discontented or lacking in motivation, review things. If something is causing you concern – have the courage to discuss it, then be strong and listen to your “inner” voice – do not listen to others at these times. Before you make your next move – ask yourself if you are happy with things so far? In the first position: Must strive to maintain interest and avoid a blase attitude. Learning to enjoy the efforts of others to learn what you already know, while avoiding patronizing them. Path may be difficult as you must work side by side with those having problems. In the second position: Things may have gone too well, leaving you spoiled. Have you used your resources well enough, to full advantage? Physically, you may be capable of much more. Value more highly your roots. In the third position: Too serious about the wrong things; not serious enough about the right things. In the fourth position: Perhaps here is too much admiration for the free spirit. (You would say, “How is that possible?”) But, maybe carefreeness is leading to extremes – problems with constancy, finding it hard to be serious about your emotions. In the fifth position: Too much or too little confidence, check the facts. Overly optomistic or pessimistic. Impatience. Avoidance or complete escapism. A need to prioritize and simplify. Self-analysis, redirection for gaining self-esteem. In the sixth position: Do not loose yourself in the clouds. Be prudent. Guard against pessimism in creative and personal relationships. Do not let the facility you have with creativity and relationships diminish their importance to you. In the seventh position: Things may have gone too well, leaving you spoiled. Have you used resources well enough, to full advantage? Physically, you may be capable of much more. Value more highly your roots. In the eighth position: Off center from your ideal, feeling uncomfortable. Behavior may be anti – social, even rude. Take charge of yourself. You as Chairman of the Board need to pull rank and set some new ground rules for where you are going. Time for tough self – love. 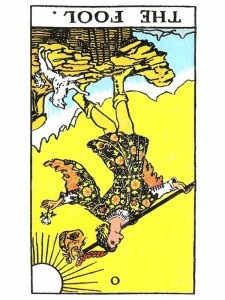 In the ninth position: Too light-hearted or too heavy, for the present situation. Too light – you may be missing some of the deeper possibilities of the situation at hand. Too heavy – you may be forcing or projecting on situations more than is appropriate. Subconscious may be screaming for attention. What about your dreams now? In the tenth position: Be more serious where you have been much too frivolous. Be much more light-hearted and light – minded where you have been much too serious.